So, it used to be that I had to suffer the extortionate prices and watchful, beady eye of shopkeepers at the Chinese supermarkets in London's Chinatown in order to buy just one or two overpriced packets of the Japanese rice crackers I missed from home, or the abalone-flavored instant noodles my Dad would drop into the soup at the end of our hot pot dinners. I'd carry my sad bags of shopping home, feeling cheated, but happy that I had just a little reminder of home in my London flat. NOT ANYMORE, MY FRIENDS, NOT ANYMORE. After I went to Alice's wedding dress fitting on Wednesday (which, btw, was SO MUCH FUN - I may hate weddings and everything white, but I squealed every time she came out of the fitting room), I went to Tesco in search of mirin for a salmon recipe I was making and nearly dropped to my knees: there, in front of me, on the shelf, was the biggest stock of my favorite Chinese snacks, all lined up as if they were waiting for my arrival. Vitasoy (a soy drink that also comes in delicious malt flavors), the first item I spotted, was a brand I hadn't seen since I was a child, sitting on my grandma's bed in her Happy Valley apartment in Hong Kong, sipping through the little plastic straw as if my life depended on it. Next to it were packets of Demae Ramen and another type of instant noodle that we buy at Ranch 99 Market in Renton. They even had my favorite brand of miso soup! I was in Chinese (and Japanese) snack heaven. Like a possessed person, I started scooping Demae ramen packs into my arms (I hadn't bothered to get a basket because I didn't expect this miracle to occur) until Alice had to take some for me because, in my excitement, I was dropping them on the floor. Oops. In the US, I stock up on miso soup packets, those rice crackers that I love, the occasional pack of White Rabbit candy, and as many Pocky and Yam Yam packets as my suitcase can possibly hold. Then I eat them while crying on the plane on my way back to the UK because I miss my parents so much. I land at Heathrow, then repeat the same in my flat while watching Keeping Up With The Kardashians until John appears at the living room door just to study my swollen, puffy eyes and say, "What are you eating?" Ramen might not be considered a snack, but it is in my family. When I was home in July, I whined that I needed a snack (between lunch and dinner). "Why don't I make you a ramen with Chinese meatballs and fishballs?" my mom suggested perkily. "A snack, Mom, I said I needed a snack," I snapped. "Not a meal." 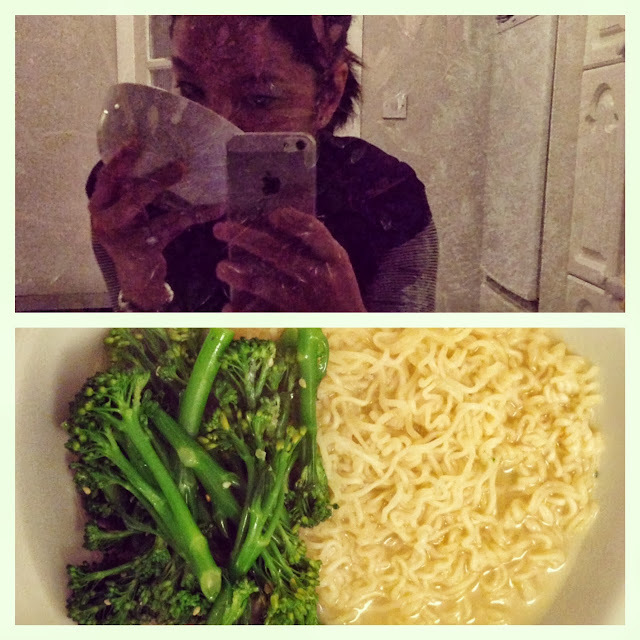 "Ramen is a snack," she said, looking wounded. So, ramen and all these other "snacks" - the rice crackers, the Vitasoy soy milk boxes, Pocky sticks, etc. - are really my comfort foods. They remind me of my childhood and of my home, where my Mom keeps them well-stocked. It sounds ridiculous, but I'm comforted by the fact that the Tesco across from Islington Green has these foods. This is me, tonight, slurping up a big bowl of Demae ramen noodles. Today Asian market says that Oil resumed its downtrend as demand weakens in the face of a slowing Chinese economy, weakness in Europe, oversupply and expectations of a flood of Iranian crude onto world markets.